If you’re going to write software you’ll undoubtedly run into a few bugs along the way. 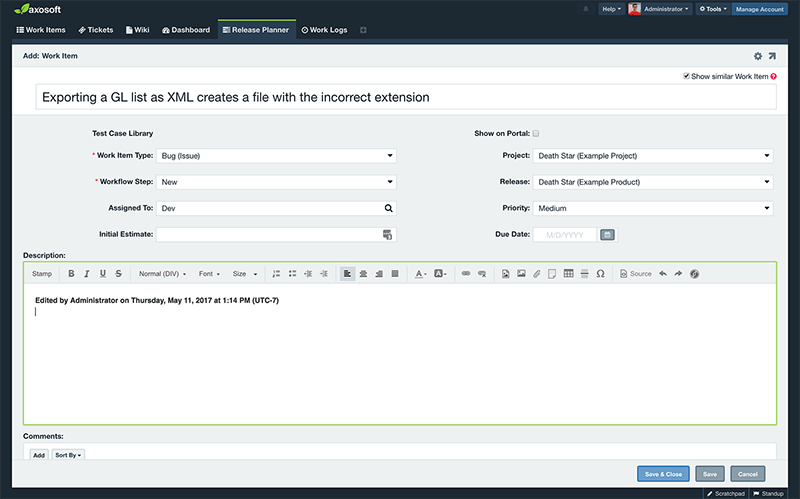 Here are some quick tips on how to efficiently manage and track those bugs! Good bug tracking begins with the robust management of your projects and releases; the better your setup, the less overhead you’ll be introducing to your team. Having a logically-structured approach to your project releases allows you to more readily handle unexpected changes or interruptions to your projects—including bugs. Using sticky notes, a notepad or spreadsheets makes it easy to record when you see a bug, but if you do this for a couple weeks you’ll quickly find out that the lack of organization causes more problems than it’s worth. The best solution is to find a unified tool where defects can be monitored in a database and related specifically to other items such as releases. We’ve used our own flagship product to demonstrate the concepts we’re discussing here, and though we’d strongly recommend that your team use Axosoft for project management and bug tracking, these concepts should translate to whatever software you are using for tracking your bugs. Ready to start using Axosoft for bug tracking? What fields should appear on the defect form when someone is reporting a bug? Should your form fields appear in a specific order? Are there any read-only fields? You may also want to include some optional fields that will help the person reporting the bug provide additional information, such as an option to include screenshots. Remember that too many fields can be confusing and discourage people from reporting bugs, while too few fields may not effectively capture the key information. So, once you define your fields, try not to continually add fields every time someone has a new idea for one because chances are you’re overdoing it. A field template with multiple fields for collecting information. Shown in Axosoft. Start a Free Trial Now! How do you want bugs to be organized? They can be categorized by project, version or release of the software. Will some people have limited access to certain bugs? Will some people have limited access to certain fields? These considerations will help automate your bug process in the most efficient way. Filtering a backlog by selecting the project Death Star and the release v1.0. Shown in Axosoft. Start a Free Trial Now! How are bugs assigned, prioritized and scheduled? How should a bug move through your organization, e.g., is there a set path that your bug must take from step to step? Will a defect be able to move from ‘Found’ to ‘Fixed’ directly, or should it pass through a ‘Testing’ phase first? Are there any rules you would like to tie to certain steps of your bug tracking process? Would you like to receive an email notification if a defect reaches a certain step? Notifications are a great way to make sure the right people know when a bug is created, moved to a new workflow step, fixed, etc. For developers, if your QA team is giving you trouble, lay down the law and start only accepting bug reports through your database and not any other method. When testers send you emails with bug reports, simply ask them to put the bug report in the database instead. In addition to ensuring things stay organized, this also helps those doing the reporting to provide the necessary information by defining required/optional fields. For testers, if your developers are resisting the change, just start assigning them bugs to fix in the database and let automatic notifications take care of the rest. Developers will gladly use the system if it saves them time. One way to create a more efficient process is to have QA or support verify bugs from customers and put the exact repro steps in the database before the developers are even notified. Effectively tracking your defects and bugs is one important aspect of having a robust, reliable and consistent project management framework. 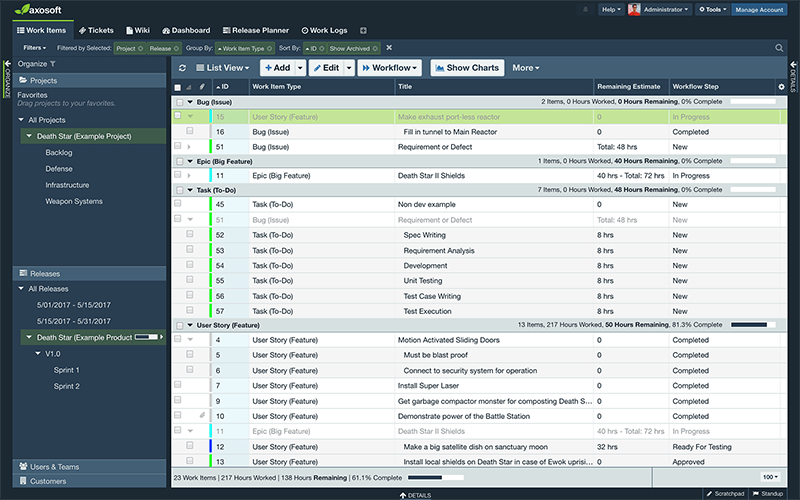 If you’re looking for fully-featured agile software to meet your needs—including bug tracking—start a free trial of Axosoft today. © 2002–2019 Axosoft, LLC. Made with in Scottsdale, Arizona. Hey there, Internet Explorer user! Just giving you the heads up: Axosoft (and this website) works best with IE 11+ or another modern browser.